A 'Third National Center' in South Korea? In November of last year, the Korean Labor Unions Confederation .KLUC) was founded as a so-called 'third national center' in South Korea next to the progressive Korean Confederation of Trade Unions .KCTU) and the conservative Federation of Korean Trade Unions .FKTU). The KLUC's president, Yeon-su Jeong, who is also president of the Seoul Subway Labor Union .SSLU), promotes a 'new form of unionism' based on labor-capital cooperation to increase productivity. Criticizing the KCTU's "excessively ideological orientation", and both the KCTU and the FKTU's "bureaucratic nature," Jeong claims that the KLUC's philosophy is more in line with the perspective of ordinary Korean citizens. Since its establishment, however, the KLUC has been fraught with controversy. Progressive forces criticize it as the 'MB .Myung-bak) union'. Indeed, Jeong, along with 747 former KCTU officers, publically proclaimed his support for then Grand National Party presidential candidate Myung-bak Lee in 2007. The KLUC was formed, moreover, with significant support from the Lee administration in the wake of the FKTU's break with Lee's New Frontier Party .NFP, the successor to the Grand National Party) and formation of a strategic alliance with the liberal opposition United Democratic Party .successor to the Democratic Party). The KLUC receives government subsidies, and has been granted seats on tripartite committees by the administration behind the backs of the other two national centers. Strong suspicions also exist that KLUC officers gave financial support to government officials responsible for illegal surveillance of KCTU and FKTU leaders. Critics claim that the KLUC was formed, not so much to represent the interests of union members as to serve as a NFP tool for co-opting the labor movement and a means for Jeong to pursue his political ambitions. With at most 40,000 members, the KLUC is currently much smaller than the other two national centers, which both have memberships of several hundred thousand. The SLLU, which has 8700 members, is currently the KLUC's largest affiliate. Two other large unions, Hyundai Heavy Industries and KT, which were expected to affiliate to the KLUC last year, have failed to do so. Perhaps, most significantly, several court rulings have called into question the legality of the SSLU's affiliation to KLUC and with it, Jeong's position as president. In April of last year, 53% of SSLU members vote to leave the KCTU and affiliate to the KLUC. The Ministry of Employment and Labor found the vote fair and permitted the SSLU to switch affiliations. A group of SSLU members, however, filed as suit against the decision, arguing that changing affiliations means a revision of the union's constitution and, thus, requires approval by a two-thirds majority. In October 2011, a lower court ruled that the change of affiliations was invalid. This July, an appeals court upheld the decision. A final ruling by the Supreme Court is expected next year. According to one SSLU delegate, the appeals court verdict has given strength to KCTU supporters within the SSLU. At the same time, more and more SSLU members are becoming frustrated with Yeon-su Jeong's unilateral style. Pro-KCTU delegates are using this opportunity to talk about the nature of the KLUC and the likelihood that Jeong's policy of 'labor-capital cooperation' will lead to "emphasis on results, performance evaluation and competition .between workers), destroying the sense of community between colleagues." They are also reflecting on the fact that the shortcomings of the KCTU in becoming a true symbol of democracy and in protecting rank-and-file members against capital's attack, as well as their own failure educate their colleagues about the character and significance of the various national centers, drove some members to seek a new path in the KLUC. Commenting on the current state of the SSLU, the same delegate made the following remarks: "The Supreme Court decision may be helpful in the defense of our democratic .KCTU-affiliated) union, but it will not be decisive. Rather, it is how democratic .pro-KCTU) forces .within the SSLU) conduct ourselves, and the vision we put forth that will be most important. We have not yet been able to fully regroup or become fully active. But we are currently evaluating our past limitations, while beginning to build worksite committees to put a new vision into practice. Our goal is to make it possible for a democratic leadership to win the union election in December. If this happens efforts to build the KLUC will weaken or naturally die out completely." 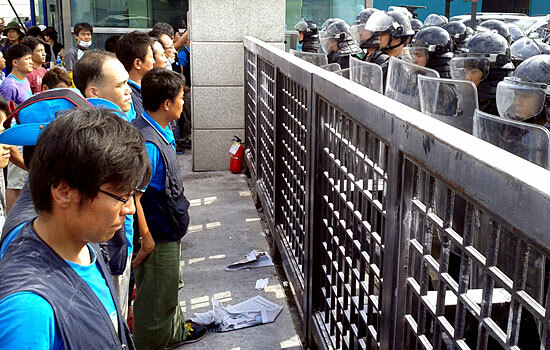 During the last week of July, the day before the summer holiday began, contracted private security squads were sent in to crush workers' struggles at the Hyundai Motor suppliers SJM and Mando. The attacks happened within 10 hours of one another, with management locking workers out at both factories. Since the advent of the Myung-bak Lee administration capital has executed careful plans to break unions at important worksites in each region across the country: Valeo-Mando in Gyeongju, Sangsin Brake in Daegu, KEC in Gumi and Yoosung Enterprise in Chungcheong. Now this effort to weaken the democratic labor movement has been brought to the metropolitan area with the attack on SJM .Gyeonggi Province) and reached the a national scale with the attack on Mando, a company with worksites around the country. Each time, the method for breaking the union has been similar. As soon as workers begin a strike, a private security squad or hired thugs are brought in. Workers are forced out of factories, the doors of which are then locked. Following management proceeds to allow only those who leave the KCTU-affiliated democratic union or join a yellow union to return to work. SJM is a central worksite among the affiliates of Korean Metal Workers Union .KMWU) Gyeonggi Branch, while Mando is the largest auto parts supplier in the country and the one structured most similarly to parent auto manufactures. Given that the SJM and Mando have no relationship to one another other than both being Hyundai Motor suppliers, it is widely believed that Hyundai Motor is behind the closely timed attacks. Since the beginning of the 2000s, Hyundai Motor has sought to minimize stock through the introduced "Just In Sequence" .JIS), an extreme version of "Just in Time" production .JIT). JIS involves not only strict planning of the assembly process at Hyundai plants, but also tight control over the timing and sequence of subcontractors' production and supply of parts to bring them into sync with operations at the parent company. Given Hyundai's use of JIS, the blow to production caused by a work stoppage by a strong union at a subcontractor can be severe. For this reason Hyundai has sought to weaken unions at its first tier subcontractors. Against the backdrop of the Lee administration's anti-labor policies, Hyundai's intervention in labor relations at the KMWU's main worksites has grown to new extremes. 3 days into the lock out at Mando, a yellow union was established. During the summer vacation, management carried out individual education for KMWU union members, seeking to convince them to join the new union. Only a week after the yellow union was formed, 1936 out of 2264 KMWU members had joined. When the number of workers who joined the yellow union reached 85% after two weeks the company ceased its lock out. At the same time, it notified the KMWU Mando Chapter of the cancellation of its collective bargaining agreement, saying that it would being procedures to unify bargaining channels now that there was a new bargaining representative. On September 4, the company fired the president of the KMWU Mando Chapter and other union officers for 'disciplinary reasons'. Having become a minority union .without representative status) in a matter of days, the KMWU Mando Chapter is now trying to rebuild, but the road ahead is a rocky one. The situation at SJM has been more hopeful. Workers there fought against the company's lock out for over a month. Of 260 KMWU members, only 10 disaffiliated. The remaining 250 gather in front of the factory every morning to protest and take turns maintaining a protest encampment at the factory gates. Having predicted forceful repression, the union officers and members prepared well for their struggle in advance. They are also receiving considerable support from other workers in the Gyeonggi area. KMWU members from other worksites join the SJM Chapter members to maintain the protest encampment each night. At an emergency KMWU Gyeonggi Branch, delegates assembly held on September 5, delegates voted to hold a 6-hour general strike on September 13 in solidarity with the SJM struggle. They also agreed that all KMWU Gyeonggi Branch members would contribute 20,000 won .roughly 18$) a month for six months to a strike fund for the SJM workers. In recent years, unions at important worksites around the country have collapsed or been greatly weakened due to capital's offensive, carried out under the protection of the government. Given Mando's scale, and the fact that Mando workers have had a democratic union for many years, the quick defeat of the KMWU Mando Chapter was a great shock to the South Korean labor movement. The persistent struggle of the SJM Chapter, however, has kept hope alive. After the use of private security squads at Mando and SJM, other companies, including Doowon in Gyeonggi Province and Sensata in Northern Chungcheong Province, abandoned similar plans. Capital has become nervous, and workers empowered, due to the determination of the SJM workers. Hopefully, their resistance to capital's attack marks the beginning of a true workers' counterattack. Starting on January 25 the world watched with baited breath for 18 days as the people of Egypt took to the streets, chanting, praying, battling security forces and, above all, calling for the resignation of President Hosni Mubarak. And then it finally happened. On Friday, February 11 the president and his family left Cairo for their home by the Red Sea. Shortly afterwards, Egyptian Vice President Omar Sulieman, appointed 12 days earlier in an attempt to appease protestors, announced that Mubarak had passed all authority to the Supreme Council of the Armed Forces. The military authorities responded with their third statement in two days in which they promised to, "conduct free and fair presidential elections," and "sponsor the legitimate demands of the people." The mainstream media has portrayed the January 25 Revolution (as it is now being called) as a spontaneous revolt sparked by the uprising in Tunisia that toppled the government of President Zine El Abidine Ben Ali on January 14. That Egyptians drew great inspiration from Tunisia is undeniable. In fact, however, the January 25 Revolution has strong roots in the political and socioeconomic structure of Egyptian society. Far from spontaneous, it was the culmination of the organizing of Egyptian democratization activists, young people and worker over the last several years. Understanding this background is important to grasping the true meaning of the January 25. This article investigates January 25th's domestic origins as a basis for assessing the possibilities for structural change the revolution has opened up. What was it that sent millions of Egyptians into the streets on January 25 and kept them there, and especially in Tahrir (liberation) Square, for the next 18 days? The most immediate cause was the call for a mass protest against police corruption and human rights abuses put out by several opposition and youth organizations. The plan was to rally in front of the Ministry of the Interior on January 25, Egypt's National Police Day, asking for the Minister's resignation. Demands for the day also included restoration of a fair minimum wage, limitation of the presidency to two terms, and repeal of the repressive Emergency Law (explained in detail below). These demands, and the organizers hopes that January 25 would become "something big", grew out of mounting frustration with economic disparity and the repression of democratic rights that have defined Egyptian society for the last several decades. In Egypt, class polarization, dictatorship and the alliance with the United States are closely intertwined. This configuration of state and society has its origins in the years following the death of Egypt's first president, Gamal Abdel Nasser in 1970 during which time the nationalist foreign policy and authoritarian populist system of government that had defined Nasser's rule were dismantled. During the 1970s Nasser's successor, President Anwar Sadat, began an open alliance with Egypt's newly rising urban capitalist class, a product of Nasser's state-led industrialization, and opened the economy to foreign investment. He also concluded a peace agreement with Israel and established an alliance with the U.S. based on acceptance of latter's role as strongman in the region in exchange for billions in military aid and economic assistance. Following the neoliberal agenda promoted by the U.S., IMF and World Bank, Sadat began privatizing public enterprises and cutting public expenditures on healthcare, education, public sector salaries and social security. Mubarak, who came to power in 1981 after Sadat was assassinated, strengthened the alliance with the U.S. and continued the implementation of neoliberal policies. Economic reforms during the last three decades have included a reduction of food subsidies established during the Nasser era, the rollback of land reform and liberalization of the rural land market, further privatization of state-owned enterprises, greater openness to international financial markets and foreign investment and the establishment of special economic zones (SEZs) where investors enjoy tax concessions and weak labor regulations. The end of land reform sent much of the rural population to the cities, which soon became over-crowed with the poor and unemployed. Privatization was accompanied by layoffs, a reduction in real wages, deterioration of working conditions and labor flexibilization. The SEZ, established through Law No. 83 of 2002, have furthered these downward trends. As Columbia University historian Timothy Mitchell notes, Mubarak's policies put public funds in fewer and fewer hands, diverting resources away from labor-intensive industry, agricultural development and education into the pockets of financers and speculators. The Mubarak regime developed a strong relationship with a small group of businessmen, whom it favored with government contracts and in the sale of public enterprises. This relationship has been especially tight in recent years, due to the influence of Mubarak's son, Gamal Mubarak, and Ahmad Nazif, Prime Minister from 2004 to January 2011. The business elite has been the main benefactor of Egypt's rather impressive economic growth, (GDP averaged 7% growth per year between 2005 and 2008), which thinly masks rampant poverty and stark class polarization: Some 40% of Egyptians live on less than $2 a day while a hundred families own more than 90% of the country's wealth. Egypt's unemployment rate is near 10% and much higher for youth: 30% of university graduates are unemployed. 60% of all workers are employed in the informal economy. Mubarak protected the wealth of a few and maintained his regime through widespread repression of democratic rights. An Emergency Law justified as a measure needed to defend against terrorism has been in place consistently since Sadat's assassination in 1981. It grants vast powers to the police, suspends constitutional rights, legalizes censorship, allows the government to imprison individuals indefinitely without charge, sharply restricts street demonstrations, and prohibits unapproved political organizations. Egypt's most recent general elections are known to have been particularly corrupt. In the lead up, the government carried out widespread repression, baring candidates from running, preventing citizens from voting, and arresting a thousand members and supporters of the Muslim Brotherhood, Egypt's largest opposition organization, which had made significant gains in the previous elections in 2005. This deeply entrenched economic disparity and political repression led to ever-increasing anger and was the main impetus behind the revolution. A wide, cross-class segment of the population had come to see the government as acting in the service of someone other than them: itself, the neoliberal elite, the U.S., Israel. The protesters who brought Mubarak down did so based on a complex mix of socioeconomic and political grievances against this government that had turned its back on them and the system it represented. The media has cast a spotlight on Egypt's well-educated youth as the main force behind the protests. It has also highlighted the role of facebook and twitter in mobilizing millions. This emphasis on online social networks makes youth participation in the protests appear highly spontaneous, lacking planning and organization. While it is true that many out in Tahrir square had never been to a demonstration, others had prior experience and have been organizing themselves as a political force over in recent years. The April 6 Youth Movement, one of the main organizers behind the first rally on January 25 and throughout the protests, was originally formed to support workers striking in Mahalla al-Jubra, a textile manufacturing center in the Nile Delta in April 2008. Another group, the We Are All Khaled Said Movement, was organized last year in respond to the police murder of a Khaled Said, a small businessman who posted pictures of cops dividing up drugs they had confiscated during a bust on his personal blog. The group quickly began mobilizing an all out campaign against rampant police violence and corruption. While groups such as these take the form of fluid networks, held together largely though online communication, they are not without leaders, and definitely not without power. Rather, Egypt's youth has found in online media a new mobilizing tool and a form of organization that is adequate to a situation of widespread repression and in tune with the cyberspace age. Two other forces have received considerable media attention: the Islamist Muslim Brotherhood, and the liberal National Association for Change, particularly its leader, Mohammed ElBaradei. In addition to being the largest opposition organization in Egypt, the former has been highlighted because it raises the specter of radical Islam, particularly for the Americans. This despite the fact that it has, for several years, eschewed armed resistance in favor of working within the legal system and was largely tolerated by the regime until the last general elections. ElBaradei, Director General of the IAEA until the end of 2009, has received wide coverage because he became the official representative of the protesters in negotiations with the government and because his aspirations to the presidency are well known. In fact however, neither the Muslim Brotherhood nor ElBaradei played a central role in organizing or leading the January 25 Revolution. Both took a wary stance towards the original demonstration on January 25, ElBaradei saying that, while he supported the protests, he hoped they would not "degenerate." There is another important agent in this struggle, one that has received much less attention than it deserves. This is Egyptian labor. Between February 9~11, tens of thousands public and private sector workers from a wide range of industries (textile, military equipment, postal, shipping, hospital, administration, etc.) went on strike. The labor actions were greeted with great enthusiasm by the protestors in Tahrir Square, who recognized their significance in putting pressure on the regime. In international labor circles, these strikes are credited with turning the tides decisively against the regime. When we say Egyptian labor here, it is important to be clear about whom we are talking. We are not talking about the government-controlled Egyptian Trade Union Federation (ETUF). Since its establishment as the Egyptian Workers Federation in 1957 (it was later reorganized as the ETUF in 1961), the ETUF has been controlled by the government and used as a tool to quell labor unrest. It should be no surprise, therefore, that the ETUF took a stance against "the calls of destruction" and in "full support for legitimacy for President Hosny [sic] Mubarak.. .. as a great leader keen to the interests of his people and his nation" during the protests. By law, all local unions in Egypt are required to affiliate to the ETUF. The workers who went on strike during February 9~11, however, did so outside of the ETUF structure, forming strike committees to lead and represent them. This sort of labor organizing is by no means without precedent. Since the mid 1980s, Egyptian workers have struck in reaction to the results of Mubarak's neoliberal agenda. Since the mid 1980s, Egyptian workers have struck in reaction to the results of Mubarak's neoliberal agenda. From 1984-1989 Washington Consensus policies, such as a doubling of mandatory wage reductions for healthcare and pension plans, were met with a series of protest actions, which involved tactics as radical as the blocking of traffic, arson and the destruction of train cars. From 2004 to 2009, over 1.7 million workers participated in more than 1,900 strikes and other actions, during which time workers electing strike committees similar to those that led the actions during February 9~11. These actions climaxed with the textile strikes in April 2008 that inspired the formation of the April 6 Youth Movement. Along with mass protests against the U.S. invasion of Iraq in 2003, they are credited by some with having "inculcated a culture of protest in Egypt" and contributed centrally to "the formation of a consciousness of citizenship and rights." Labor action over the last several years has developed into a nascent democratic union movement. A strike by 55,000 municipal tax collectors in December 2007 not only won its economic demands, but also led to the formation of the Independent General Union of Real Estate Tax Authority Workers, the first union completely outside the ETUF, in 2009. On January 30, in the midst of the early days of the Revolution, independent unions and workers committees declared the formation of the Egyptian Federation for Independent Unions (EFTU), an alliance complete independent of the ETUF. While some workers who struck last week limited their goals to the achievement of economic demands, a substantial number called for the downfall of Mubarak's regime. Some have gone even further to make demands that suggest a desire for a deep political, social and economic transformation. Steel and iron workers, for example, issued a statement calling for: 1) Immediate resignation of the president and all men and symbols of the regime, 2) confiscation of funds and property of all symbols of the regime and everyone proven corrupt, 3) dismantling of the ETUF and the formation of independent unions, 4) confiscation of public sector companies that have been sold, closed down, or privatized; nationalization of the public sector "in the name of the people" with new management by workers and technicians, 5) formation of workers' monitoring committees in all workplaces to monitor production, prices, distribution and wages, 6) the convening of constitutional assembly with representatives from all sectors, to revise the constitution. The newly formed EFTU's demands include: a minimum wage of 1200 LE (roughly 4 times the official minimum set in 1984) and a maximum wage no more than 10 times the minimum, the right to adequate social security, healthcare, housing, education, pensions and benefits and freedom of association. The articulation of these demands indicate an important direction for the Egyptian democracy movement and suggest that workers and independent unions role will be as vital in the days to come as it was before Mubarak's resignation. With Mubarak gone, the Supreme Council of the Armed Forces is now in command of the country. The officer on top, Council Chairman Field Marshal Mohamed Hussein Tantawi was Mubarak's Minister of Defense until February 11. He is known to be strident opponent of political change, although he did gain favor with protestors by mingling with them in Tahrir Square and other populist gestures. The military authorities now in charge had strong ties to Mubarak's regime, and the United States, and gained considerably from these alliances. All of this makes one wonder why the majority of protestors were adamant that the military step in the days leading up to Mubarak's departure. The army's restraint during the demonstrations was an important factor in winning protesters' approval. Moreover, the military has been granted a great deal of legitimacy since Nasser's time, when it gained respect for confronting Israel and the West. In addition, common soldiers and junior officers have watched their real wages fall in recent years, making their complaints very similar to those held by other Egyptian young people. In fact, however, the military elite benefit greatly from the established system. The military has been the beneficiary of nearly $40 billion in American aid over the last 30 years, which it has put to good use. It not only controls security and a growing defense industry, but also owns companies in several industries, including cement, construction gasoline, olive oil and water. It has developed huge areas of desert and coastal property into shopping malls, gated cities and beach resorts, which cater to local and international consumers and tourists. Clearly, therefore, the military authorities have a deep investment in a quick conclusion to the protests and a status quo, which may be one reason they have been reluctant to turn any authority over to opposition political leaders. On the other hand, many demonstrators appear convinced of their ability to push the military, and any government that follows it, in the right direction. Asked by a reporter what the demonstrators would do if the military sought to impose its own brand of rule, one organizer responded, "We know the way to Tahrir Square." The military authorities have now dissolved the Parliament, largely deemed illegitimate, and promised to hold elections in 6 months in keeping with protesters' demands. They have also now convened a panel of legal expert charged with drafting amendments to the Constitution, after originally saying they would keep the task for themselves. Significantly, the panel includes members of the Muslim Brotherhood and other opposition groups and has been met with approval by protest leaders. On the other hand, the military authorities have announced a ban on meetings by labor unions, effectively forbidding strikes, and have maintained the Emergency Law. Many protesters are generally pleased with the clear timeline proposed for the transition to civilian rule. Strikes continue despite the, however, and a group of protesters has refused to leave Tahrir Square, claiming they will remain until all their demands are met. With nothing to check the power of the military authorities aside from protests, the Egyptian people face the immediate task of forcing them to keep their promises. But even if they are able to do this and power is transferred to a democratically elected civilian government this will not, by any means, guarantee fundamental change. It will take determined efforts to dismantle the power of the business and military elite and a reversal of the neoliberal policies now entrenched in the Egyptian economy, to address Egypt's vast inequalities. It is unlikely that liberal politicians like ElBaradei have the political will to carry out such measures without strong pressure from below. As one Egyptian journalist noted, Elbaradei is "not the man for" a radical redistribution of wealth. Neither is he likely to break off the relationship with the United States, particularly while the military is still an influential player in Egyptian politics. Some international commentators are rather skeptical about Egypt's future. John Weeks, a professor of economics at the University of London, for instance, comments, "Extremists are likely to come to power in Tunisia and Egypt, extremists of the neoliberal variety." He notes that this has been the case in Latin America, Central and Eastern Europe and South Africa, where the transition from dictatorship to democracy in the 1980s and 1990s led to rise of governments that were, "neoliberal to the core." "When progressive forces are weak," he writes, "the agents of capital are strong, and prepared as they always are to step into the power vacuum. . . The IMF is not far behind." South Korea's experience says a lot about the difficulties that may lie ahead. The 1987 June Uprising, a movement of similar proportions to the January 25 Revolution, made possible the transition from military dictatorship to a liberal democratic form of government. This was a great achievement of the Korean people's struggle. One the other hand, the democratization movement was not able to set is sights far beyond the demand for the holding of direct elections, seeing this as the most feasible means for ending the dictatorship. When the government consented to direct elections on June 29, the movement turned its attention towards debates about which opposition candidate to support, rather than pushing for more fundamental change. In the end, the opposition failed to unite. Direct elections provided legitimacy for the presidency of military general Roh Tae Woo came to power the following year. Through this process, and the subsequent merging of political parties, the military reached a compromise with the opposition through which it maintained a good deal of its power. The socioeconomic system that supported this power remained basically intact. The presidents who have come after, including Kim Dae Jung, have pursued neoliberalism to the determent of workers' livelihoods and rights. The June Uprising opened up importance space for Korean workers, represented by the massive strike waves that followed. July and August of 1987 brought not only determined struggles for wage increase, but also the advance of democratic unions. The development of democratic unionism was an important continuation of the democratization movement in South Korea, as it will be in Egypt. Unfortunately the Korean labor movement was not united or experienced enough to organize as a decisive political force. It was also regretfully unprepared to confront the IMF when it arrived in full force in 1997-1998. If the Egyptian democracy movement can learn anything from the experience of South Korea, it is the importance of a good understanding of history, a long-term perspective on revolution, a correct analysis of neoliberalism and the strength to work through internal divisions. But for Egyptians, this should be a time not for pessimism, but for hope and renewed determination. During the days leading up to Mubarak's departure, the possibility of something different became clearly visible. Protesters in Tahrir Square got a taste not only of their own power, but of what democracy feels like. They set up their own clinics, sound stages, security teams and clean-up crews. Christians guarded Muslims while they prayed and vise versa. Women came out in surprising numbers and some played leadership roles. Workers began practicing democracy through strike committees and the establishment of an independent union federation. On top of all this, the people of Egypt have made far-reaching demands that aim, not only at the replacement of the regime, but also the eradication of a corrupt elite and economic equality. It is now up to them to articulate the relationship between the redistribution of wealth and real democracy and create a sustained long-term struggle-a revolutionary one-that can achieve both. The international labor and people's movement can play a role as well. Throughout the last three weeks unions and left organizations have supported the people of Egypt, organizing solidarity protests and getting information out past Mubarak's censorship and putting pressure on home government that, in turn, put pressure on the regime. These efforts must not stop simply because Mubarak is gone. Exchange, solidarity and international protest must continue as Egyptians continue to demonstrate. The nascent independent union movement must develop into a real political actor and strong force for protecting workers' rights. Exchange with unions in other countries and the support international unions can greatly further this goal. Finally, the international left must take to heart the message of the people of Egypt, a message which is now resonating across Northern Africa and the Middle East: Revolution is not easy, but it is possible. PSSP was founded in 1998 in the wake of the introduction of the IMF structural readjustment program in South Korea. It is our mission to cultivate a new social movement fighting against neoliberalism through 1) (re)constructing revolutionary social justice thought and theory, 2) searching for internationally-based people’s alternatives to neoliberalism’s financial and armed globalization, and 3) and reforming and revitalizing the workers and women’s movements. We understand neoliberal financial and armed as a strategy for overcoming the structural crisis of capitalism through the exploitation of and violence against workers and common people. We seek to oppose this strategy by working to build an alterglobalization movement through on-the-ground struggle to protect human and labor rights and build people’s democracy in South Korea. We are critical of the so-called citizens’ movement, which establishes an antagonistic dichotomy between ‘the people’ and ‘citizens’ and confirs legitimacy on neoliberal reforms. Instead, we promote the reform and revitalization of the workers and other traditional social movements, which have been weakened by their attempts to respond to neoliberal financial globalization in a defensive manner and on a single-country basis. As a voluntary network of citizens and activists working on diverse issues in different areas, it is our mission to put forth a new direction for South Korean social movements. Currently PSSP has a main office in Seoul and a branch in Incheon. PSSP is composed of several working bodies including a labor committee, an anti-war team, an anti-poverty team and a healthcare team, through which we work to reform, organize and strengthen Korean social movements. We also carrying out theory and policy development, public education, and solidarity work with other organizations struggling against neoliberalism. PSSP’s Incheon Branch was established in December 1999 to struggle against neoliberalism and find new energy and direction for social movements in the Incheon area. To achieve this goal, Incheon Branch members are struggling in solidarity the workers and women’s movement forces in the area, developing new direction for social movements through social movement seminars and education programs and carrying out study, education and debate aimed at strengthening critique of neoliberalism. We are also working to support and strengthen regular discussion and everyday activism of individual members through monthly meetings, small groups meetings, and publication of a membership newsletter. The collapse of existing socialism, the rise of the ‘third way’, centrism, pragmatism and bureaucratism, and the strengthening of political disillusionment caused by the generalization of neoliberalism have caused a crisis of theory and politics. Given these conditions, we seek to reconstruct a theory and politics centered on the rights of common people and people’s democracy. We are working to revive and adapt traditional critiques of political economy in a way that is adequate to a critique of the current structural crisis of capitalism. We see this work as a necessary part of the fight against the ideology of Neoliberalism, which has spread through all areas of society since the 1998 IMF foreign exchange crisis. We are making efforts concretely analyze the political structure and changes in the topography of the people’s movement brought about by neoliberal structural readjustment and financial and armed globalization. We are fighting against neoliberal financial globalization, which leads to the exploitation and plunder of people around the world. Central to this struggle is the fight against the IMF, WTO and FTAs, the systemic means through which neoliberal financial globalization is carried out. We are fighting against United State-led armed globalization and the aggression-oriented restructuring of the U.S.-ROK alliance which is subordinated to it. We seek to building a peace movement that opposes war and other forms of extreme violence and proclaims peace as a people’s right. We are working to overcome the objective and subjective crisis within the workers movement–caused by the increasingly precarious nature of employment and the weakening of democratic unions–and build a renewed strengthen workers movement. We are fighting against the generalization of poverty and bureaucratic policies for handling poverty by working in solidarity with a movement based on basic living rights that prioritizes and builds the leadership of poor people themselves. We are working for the equality and freedom of migrant workers, who are discriminated against and made into second class citizens through the process of racialized globalization. We seek to move past the dominant perspective, which treats migrant workers as the objects of help and pity and instead work together with them to develop a transnational struggle against neoliberal globalization. September, Launch of the People’s Action against Investment Agreements and the New WTO Round. December, Co-organizing and sponsorship of the People’s Tribunal on War Crimes in Iraq and dispatch of Troops by Bush, Blair and Roh.